In medium bowl, beat 2 tablespoons lime juice, the granulated sugar and 1 teaspoon fish sauce until sugar is dissolved. Add sliced cucumber; toss to coat. Cover and refrigerate 30 to 60 minutes. Meanwhile, in medium bowl, mix 1/4 cup lime juice, 3 tablespoons fish sauce, the red curry paste, brown sugar, gingerroot, garlic and pepper flakes. Add chicken; toss to coat. Cover and refrigerate chicken 30 to 60 minutes to marinate. In large bowl, beat Asian sesame dressing, 2 tablespoons lime juice, the peanut butter and 2 tablespoons cilantro with whisk. Add warm cooked noodles; toss to coat. In 12-inch skillet, heat oil over medium-high heat until hot. Use slotted spoon to transfer chicken from marinade to skillet. Discard marinade. Cook and stir 3 to 5 minutes or until chicken is cooked through (at least 165°F). Divide noodles among 4 bowls. Top with chicken, pickled cucumbers, carrots, chopped peanuts and cilantro, and serve. Hothouse cucumbers, sometimes called English cucumbers, have fewer seeds than regular cucumbers. Regular cucumbers will work, though. Just cut them in half, and scrape out the seeds before slicing. 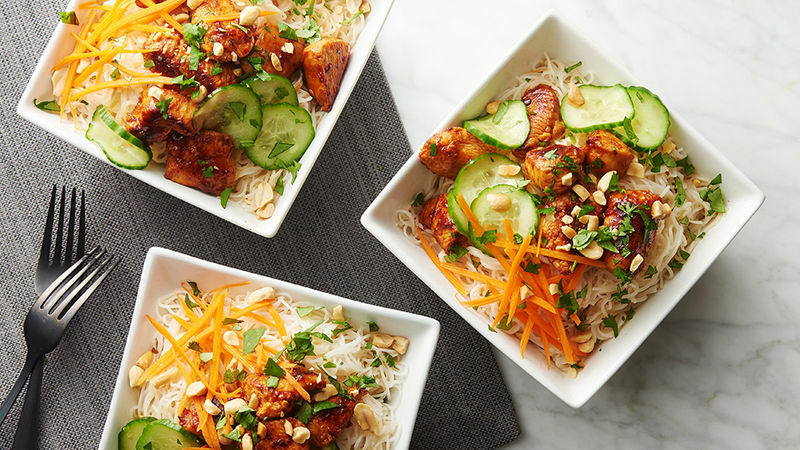 We tested this recipe with Thai Kitchen™ red curry paste. It’s worth noting that different brands come with different heat levels, so we recommend you use less or more depending on the brand’s heat level and your own preferences.